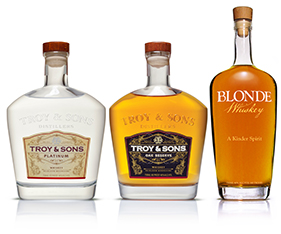 This is the last in the series of three whiskies from Troy & Sons, but certainly not the least. The Oak Reserve is a nice fit between the true moonshine of Platinum and the more traditional flavor of the Blonde Whiskey. An almost delicate flavor, there is more complexity than you might expect, from the lighter color and nose. It’s also 80 proof – to me, that allows more people to try it, that might be hesitant with a higher proof spirit. Here are my notes – sláinte! Color: The middle sister in color of the Blonde Whiskey and the Platinum, Oak Reserve is a light golden brown, similar to an Irish whiskey in color. Nose: Light and pleasant, no burn (which is what I’ve come to expect from Troy & Sons whiskies). A touch of sweetness, but you know it’s whiskey. Taste: Like the nose, this whiskey is light and balanced and sits well on my tongue. No burn, of course, but a gentle warming. It lingers a little, with a bit of the oak and vanilla coming through nicely. All my reviews will be from tasting a spirit neat, and for this one, it almost seems a shame to mix it! Other notes: This whiskey is made from the same heirloom corn as the Platinum, but is aged in charred oak barrels, which give it the light color and the touch of wood. If you’re in Asheville – stop in for a tour & tasting, say hi to Troy (if she’s not on the road!) and tell her LikeYourLiquor sent you! 3 out of 3 – nicely done! I’d heard of Old World Spirits before seeing them at my local BevMo, but didn’t really know too much about them. 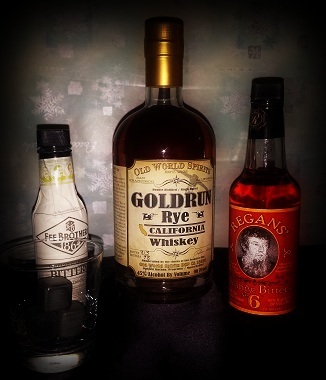 I decided to take a chance when I saw it in the case – I was in the mood for rye – and I’m glad I did! Old World Spirits Goldrun Rye is made from 100% Organic White North Dakota Rye. You don’t find many ryes that are 100% rye (the rules dictate that they’re at least 51%). OWS’s website notes it’s produced like an Eau de Vie, “..distilled twice in small batches in a unique way that enables us to retain rich yet floral aromas..”. I’d agree – it really is different from the other rye whiskies I’ve had. It’s versatile as well – everything I did to it worked. Here are my tasting notes- sláinte! Nose: has the sweet/slight burn that has rye written all over it. Not heavy or overpowering. As you get more familiar with whiskey, you may be able to tell one type of whiskey from another (rye vs. bourbon, etc) simply by smelling them. Taste: For a 90 proof spirit and 100% rye no less, this is a very smooth whiskey. The initial taste is a little sweet, with a bit of burn at the finish. I’ve tasted more than a few whiskeys recently, but this one made me look at the glass and say, “Wow” – and want to immediately taste it again. Other notes: I will say I’ve spent some time with this whiskey: neat, with one ice cube, in a lovely cocktail with Art in the Age’s SNAP (which will get its own review, stay tuned, ginger fans!). This rye is very versatile – it held up well in every way I tried it. I’d say grab it if you have the chance. 2.5 out of 3 – yum! When I read about Four Kings Bourbon, I was ridiculously excited. Granted, I’d only tried 2 of the 4 “kings” at that point, but FEW Spirits and Corsair Artisan Distillery are some of my favorites, hence my excitement. The other two, Mississippi River Distilling and Journeyman Distillery, also deserve a place on my bar I’ve decided! And then I found out the fact that it was only available in Chicago. *sigh* But never fear, social media to the rescue! Twitter has brought me nearly a 1,000 shiny new friends recently, and some of them are in the Windy City. I will not bore you with the details, but suffice it to say that I soon was expecting a special delivery from William Lorca (@ACubsFan2007 – you should follow him too, maybe he’ll send you stuff!). You’re probably familiar with collaboration brews by some of the big-name beer guys like Stone Brewing or Dogfish Head. 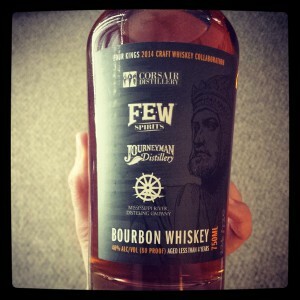 Four Kings is the first collaboration craft whiskey. Each distillery contributed 30 gallons of their whiskey, it was blended together and aged a little longer to let the flavors come together. Yes, if you ask the internet, there is a minor scuffle over the label calling it “bourbon” because it’s not technically 51% corn, with the addition of Corsair’s smoked wheat whiskey (so 1/8 of it has a non-bourbon mashbill). Personally, I say I don’t care what you call it, the choice of the smoked whiskey is perfect. Without further adieu, here are my tasting notes- sláinte! Color: Darker in the bottle than it is in the glass, it’s still amber once poured. Nose: A hint of alcohol, you can smell the sweetness of the corn with a little bit of the oak. The vaguest hint of smoke. Taste: It has a full flavor up front, with a smokiness that’s evident but not overpowering. A smooth, sweet finish that doesn’t really linger, which for me, isn’t a bad thing. Time for another sip! **Updated: these notes were from when I originally opened the bottle, about 3 weeks ago. Since then, it’s lost some of the smoke, but it still is a very tasty bourbon. Other comments: I don’t like corporate buzzwords. They annoy me. “If we all stay in our swim lanes, then we’re using our core competencies, but we need…” Oh quit. However. Synergy, or a result greater than the sum of the individual parts, is the only word I can come up with to describe this bourbon. Each one is great on its own, but brought together, creates something different that I don’t think can be done by just a single distiller. Buy it if you can find it! Only about 10% of craft distillers make rum, which makes Gubba Rum even more unique. His rum is made from pure sugar cane juice, not molasses, which gives it a silky, smooth texture. Not only is Gubba Rum tasty, but Steve Gubb is a genuinely nice guy that enjoys sharing his rum. Make sure to read my interview with him, too. Without further adieu, here are my tasting notes – sláinte! Color: Crystal clear, even with the natural coconut. Nose: A hint of alcohol, with the suggestion of sweet, it’s really light on the nose. 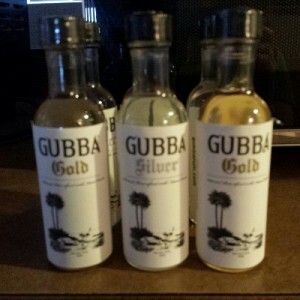 Taste: Gubba Silver has a tiny bite at the back of my tongue, that dissipates quickly, leaving behind the taste of coconut. And you can tell it’s really coconut, and not some flavoring dreamed up in a lab. It’s the coconut you dream of tasting while reclining on a sandy beach – hopefully with a Gubba rum drink in your hand! In comparison, it has a relatively low proof, but you certainly wouldn’t confuse it for coconut water. Color: Light amber, but not completely clear, because of the natural vanilla. I like being able to see proof of the ingredients right in the glass! Nose: A little sweet, but not cloying in any way, the vanilla is definitely present. Taste: It has the same bite as the Silver (which is to say, nearly non-existent), but has a slightly fuller mouth feel, which may come from the vanilla beans used to flavor the rum. You can also tell this is real deal, and not a bottle of extract dumped into the rum. Smooth, sweet and vanilla, I can see Gubba Gold mixing well in a cocktail but not getting lost, and equally at home neat or with a bit of ice. Price point: $22. On par with other rums, but far ahead in taste! Overall: I’d say that these are two tasty entries into the rum chapter of the book of craft spirits. If you’re feeling creative, help Gubba Rum name their signature drinks! Or just grab some of their rum and mix them up yourself! I will admit that I’ve encountered a vodka or two over the years. Some better, and some far worse, than others. 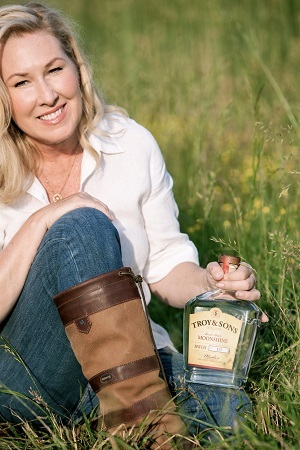 When I got into craft liquors and tried vodka, I was happy to find nuances and some actual flavors that come from using organic ingredients. The care that goes into a craft liquor is usually obvious, and Willa Vodka doesn’t disappoint in that respect. Here are my notes – sláinte! Color: I’m pretty sure this one goes without saying, right? Nose: Very faint smell of alcohol, with a touch of sweet. And when I say “faint”, I had to take a few whiffs to really get a feel for it – which is good! Vodka is a neutral spirit – it shouldn’t jump out at you before you even taste it. Taste: I start every review with the chosen spirit neat, so I noticed the legs on the glass first, which is pretty unusual for vodka. (Legs are basically what stays on the side of the glass after you swirl it around, normally a wine term.) The key brand facts on their website mention an optimum viscosity, which isn’t something I associate with vodka, so I was intrigued. The taste has pretty much the same amount of burn as the smell – which is to say, almost none. Very smooth, light finish. Adding the single ice cube (also suggested from their site), it’s actually even smoother, with an almost chocolate finish. ABV: 35% (70 proof) It has a slightly lower ABV than its counterparts, along with a slightly lower calorie count. Price point: $28. Vodkas that I’d consider drinkable range from $25-$60, so this fits nicely in anyone’s budget. Get your bottle here. Other notes: Willa Vodka is a versatile spirit. Smooth and clean, it works on the rocks or would mix well in any of your favorite drinks. It seems a shame to lose this vodka in a Bloody Mary, but to each his own. For me, a squeeze of a Meyer lemon did nicely (they are sweeter than regular lemons). This craft spirit has all the great characteristics combined into one glass: it both tastes and smell like something you want to drink. Mix it or not, it works either way. Price-point makes for an affordable everyday drink and is definitely a good choice for a gift. 2 out of 3 – yum!